I must admit that I know almost nothing about touring by bike and have never tried to it out, so I was pleased when seasoned tourer Terra Ash contacted me from Iowa in the US and offered to write a guest blog post or two. That turned into a series of three blog posts about touring that will be published over the next few weeks. Enjoy………. 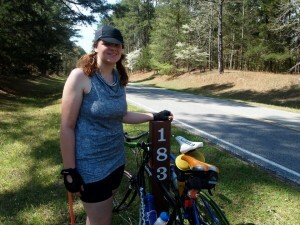 Bike touring can be one of the most enjoyable forms of cycling. The first time you transport yourself using nothing but your body to travel to your destination you will simultaneously realise how small and big the world is. A lot of people envision long tours of a week or much longer when they think of bike tours, but bike tours can be overnight trips, week-long trips or much longer endeavours of a year or more. Daily mileage can range from 20 miles (32 km) (or less) to over 100 (160 km). The first time I ever toured I went on a weekend trip with my significant other and we were hopelessly naive. We were used to riding 30-50 miles (50-80 km) at a time, and didn’t think the 75 miles (120 km) to Jefferson, Iowa, would be a problem for us at all. The tour was sponsored through a local bike club and was completely on trails. We put our tent and sleeping bags on a bus and carried backpacks with clothes on our backs for the full 75 miles (120 km). We had no sunscreen, didn’t eat enough food and I rode the whole way wearing Converse. We were so miserable we couldn’t even enjoy a beer after we set up our tent. Learn from my lesson, and think about these things before you go out on your first tour. It might seem obvious, but if your first tour is significantly longer than the longest ride you’ve ever done you might be setting yourself up for failure. Distances of 30-70 miles (50-110 km) are usually a good place to start for a first tour. A two-day bike tour is a great place to start, but I know a lot of cyclists who have done week-long tours with minimal training and survived. It’s easy to invest a lot of money in a bike before going on your first tour. Don’t invest in an expensive touring bike until you know bike touring is something you want to do for the long term. Any existing bike can be used for touring, although having a range of speeds is helpful especially in hillier terrain. Just make sure your bike is tuned up and carry tools for fixing a flat tyre. If you’re going on a tour with an organised group you might be able to borrow a bike that is better equipped for touring. Do not forget to pace yourself. One of the biggest mistakes I made on my first tour was trying to ride the whole thing as quickly as possible. Touring really is more about the journey than the destination. I usually take a break every 10-15 miles (16-25 km) when I tour now to explore, eat some food and relax in the shade. If you push yourself too hard in the beginning you will fizzle out quickly and the experience will be much less enjoyable. Most of the bike tours I’ve done are in my home state of Iowa. This is mostly for convenience, but I was happy to do my first bike tour close to home. While I never needed to, it was comforting to know I could easily get back home since I was less than 75 miles (120 km) away. Another factor to consider is the route. If you aren’t comfortable riding on roads yet a trail tour might be a better fit, but low traffic or speed roads are also good for touring. You can carry your own gear on your bike or join an organised tour and have you gear transported to the end for you. Bagging (carrying your own gear) is incredibly empowering, but does require additional training miles with gear to prepare. Find the option that works best with your comfort level and experience. Terra Ash Bruxvoort is a twenty-something Des Moines, Iowa, USA, based cyclist and writer. She was the last person in her second grade class to learn how to ride a bike, and didn’t fall in love with the sport until her sophomore year of college. She started out riding trails, became a bike commuter, started touring and eventually raced time trials. She’s been riding almost daily (even through the freezing Iowa winters!) for five years. You can read her musings on nature, raw foods and minimalism at Modern Girl Walden and her observations on bike commuting on Twitter @bikecommprobs. I just started biking a couple of months ago and the most I’ve done at a time is 31miles. This post was very insightful. Thank you!